The philosophy of the music department is to allow each child to discover the joy of music through active participation in making music. Singing skills are encouraged at the earliest age, accompanied by a variety of melodic and rhythmic instruments. Pitch is taught using Solfège hand signals. Students learn to play instruments both through reading musical notation and by enhancing their natural aural skills. 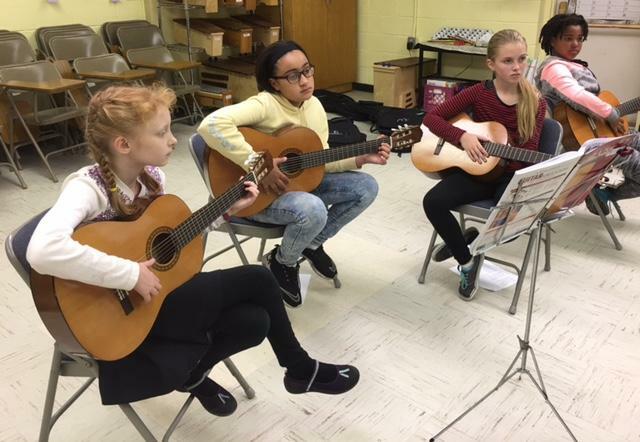 As they progress through the grades, the classes learn to play pitched percussion instruments, Irish whistles, Appalachian dulcimers, ukuleles, guitars, marimbas, and drums.The students enjoy many performance opportunities throughout the school year with the Thanksgiving Program, Holiday Pageant, and Spring Concert being the highlights. Music Meeting each Friday is a chance to be part of music shared by the entire student body at one time.The lifelong principals of teamwork are reinforced in a unique way as students learn to express themselves personally while supporting their fellow classmates as they work together in ensemble musicianship.